Weight category - 66 kg. Elbrus Tedeev was born and raised in Nogir, North Ossetia. 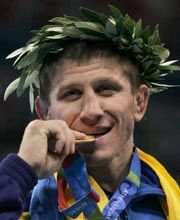 He started learning wrestling techniques in Vladikaukaz, but then in 1993 well-known trainer Boris Savlokhov convinced him to move to Kiev, Ukraine. Since then he has competed for the National Ukrainian team. After B. Savlokhov unexpectedly died, the head coach of the free-style National Team of Ukraine – Boris’ younger brother Ruslan Savlokhov became E. Tedeev’s trainer.